Cigar Advisor Magazine is a digital publication dedicated to providing cigar enthusiasts with entertaining and informative content. Their February 2013 issue features a piece entitled "Wrapper Shade Nomenclature" that educates readers on the unique characteristics of each type of cigar wrapper leaf. Cigar Advisor has published an educational piece teaching smokers about different types of cigar wrapper leaf. The article was written as a beginner's guide to understanding the various terms used to describe cigar wrappers, which are the natural tobacco leaves that surround the interior tobaccos, or fillers and binder, in a handmade premium cigar. The all-new Cigar Advisor Magazine is an online cigar magazine that brings a fresh, irreverent, and down-to-earth perspective on all things cigars to thousands of smokers. In addition to educational cigar content and behind-the-scenes cigar industry articles from some of the business’s top names, Cigar Advisor delivers an array of content about a variety of topics of interest to people who enjoy the cigar lifestyle. The magazine also features cigar reviews and ratings submitted by real smokers, and much more. Cigar Advisor Magazine has just published a new article in its February issue. 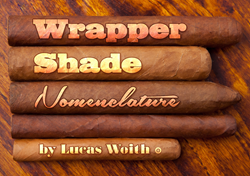 Cigar lover and Cigar Advisor contributor Lucas Woith wrote the article, entitled "Wrapper Shade Nomenclature." The article was written as a beginner's guide to understanding the various terms used to describe cigar wrappers, which are the natural tobacco leaves that surround the interior tobaccos, or fillers and binder, in a handmade premium cigar. As Woith describes in the article, many beginners describe cigar wrappers using the terms "natural" or "maduro," which typically indicate nothing more than the wrapper's color. There are in fact a plethora of different terms to describe color, including double claro, claro, colorado claro, colorado, colorado maduro, maduro, and oscuro. Another color-based convention from the mid-19th century is American Market Selection, English Market Selection, and Spanish Market Selection, or AMS, EMS, and SMS, respectively. But as Woith points out, flavors, strength, and aroma exist independently of wrapper color. A better way of describing the wrapper leaf is to name the seed type and its country of origin. Woith closes out the article by enumerating some of the more popular types of cigar wrapper tobacco, and lists examples of each wrapper type he considers to be "worth trying."